When it comes to the June Retail Sales report, it has historically been pretty weak relative to expectations. Since the expansion began in 2009, there have only been three better than expected June reports out of nine. 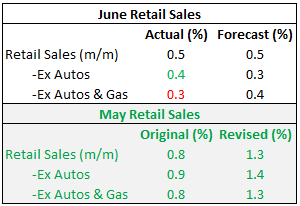 Even worse, heading into today’s report, five out of the last six June Retail Sales reports were weaker than expected. Based on that record, the fact that today’s report for June was inline with expectations at the headline level is almost considered a win! Ex Autos, the report was even stronger than expected, while Ex Autos & Gas, it was weaker. So there was a little of everything. What was really impressive about the June report was the half percentage point upside revisions to May (see table to right). The last time the report had a larger upside revision to the initial report was almost a year ago last August. 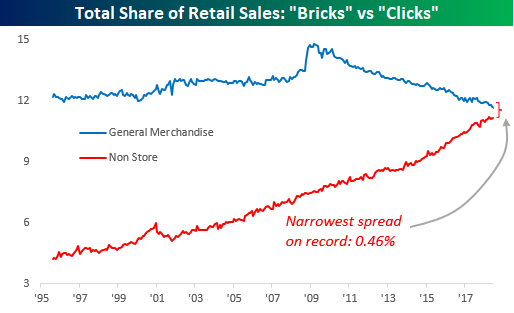 Another interesting trend involving this month’s report was the ongoing shift from “Bricks to Clicks” and “Death By Amazon” which we have been highlighting for years now. Following June’s report, we are increasingly reaching the point where Online’s share of total sales will overtake the General Merchandise category, as the spread of less than 0.5% between the two sector’s shares was the narrowest on record. That’s quite a difference from 20 years ago when General Merchandise was at 12% and Online was under 5%. In a just-published report for Premium and Institutional clients, we provided a complete analysis of this month’s Retail Sales reports and how recent shifts have impacted overall trends. To unlock this report, sign up for a Bespoke Premium trial membership now!